Kumar Sangakkara admits Sri Lanka’s loss will be England’s gain after coach Paul Farbrace was lured back to his native country. The former Kent wicketkeeper left his post as Sri Lanka coach after just four months to become Peter Moores’ assistant. Farbrace is set for a key role as Alastair Cook’s men attempt to plot tourists Sri Lanka’s downfall this summer. Moores’ second-in-command led Sangakkara and his team-mates to Asia Cup and World Twenty20 glory during his brief spell at the helm. And while the nature of his departure left something of a sour taste in Colombo, 36-year-old batsman Sangakkara has no doubts about Farbrace’s ability to help forge a recovery in English cricket. He said: ‘Paul is a big loss for us. We enjoyed working with him in 2008-09 when he was the assistant coach to Trevor Bayliss. ‘When he came back, I think everyone was very excited because he’s a lovely guy and he gets on really well with the team. ‘He could understand how Sri Lanka works and his impact was really important for us in those three months. ‘It’s unfortunate, the circumstances surrounding how he left, it was probably not nice, but England will gain hugely from Paul. For all the disappointment surrounding Farbrace’s defection, he presided over a watershed in Sri Lankan cricket which paid early dividends in Bangladesh earlier this year. 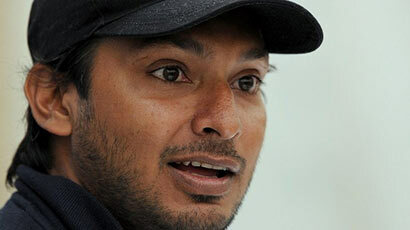 Sangakkara may be coming to the end of his distinguished career, but he is confident the future is bright. He said: ‘Going into the Twenty20 World Cup this year, we had a very different team from what we have had in the past with a lot of younger players. ‘But Sri Lanka has got this knack of producing players who are able to deal with situations very well. It’s been great to watch these guys blossom. ‘To be part of a team that won the Twenty20 World Cup was incredible. We have always performed very well and had a very consistent team. It’s just a case of these guys having a bit more experience. Sangakkara has no immediate plans to lay down his bat, but he knows that the time is coming when the prospect of retirement will become a very real one. He is determined to wring every last minute out of his career, but is adamant that he will not need to be told when his time has come to go. He said: ‘In 50-over cricket, I hope to play to the next World Cup [in Australia and New Zealand early next year] – that might be my last assignment. Looking at Test cricket, there might be another series after that. It depends on the chat I’ll have with the selectors and the authorities back home. Sangakkara this week arrived at Durham, for whom he will play two LV= County Championship matches before joining up with his country, and hinted he could return to domestic cricket in England again after his international career has drawn to a close. However, his motivation remains as strong as it ever has been. He said: ‘I still enjoy playing, I enjoy wearing the Sri Lankan shirt and coming out. It’s tough to train back home because it’s the opposite (to English weather). It’s a bit cold here; there these days, it’s been boiling and two hours is a test, it’s a test to get to the ground and train hard. ‘But there’s a huge enjoyment factor that comes with it, and also as players, we have been very, very lucky. ‘It’s unfortunate, the circumstances surrounding how he left, it was probably not nice, but England will gain hugely from Paul’. This is contrary to what said by Mahela. On the other hand, Paul Farbrace knows the strengths & weakness of SL players and this can go against us.